Eligible for the Youth Communication Package that was announced in Budget 2013 and looking forward to purchasing one of the selected smartphones that comes with a RM200 subsidy from the Malaysian Communications and Multimedia Commission (MCMC)? 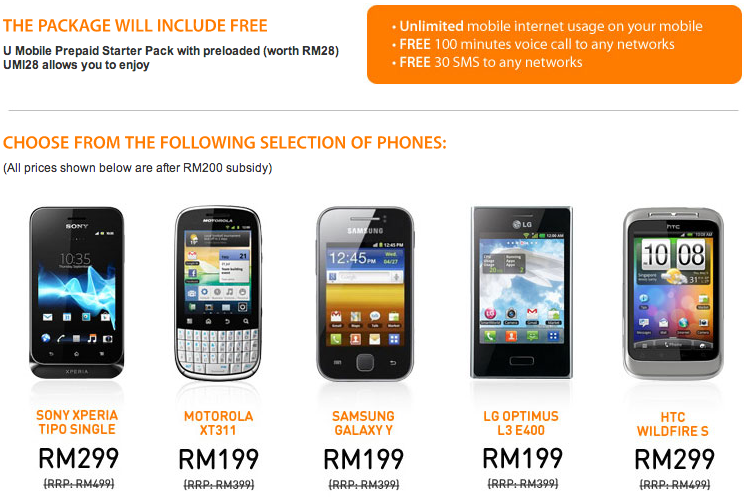 U Mobile just made an announcement that it will be selling several of the selected devices and if you purchase it with the telco, it will also come with a free U Mobile Prepaid Starter Pack preloaded with deals worth RM28 – unlimited mobile internet usage on your mobile, free 100 minutes voice calls to any networks and free 30 SMS to any networks. The deal will be available from 1 January 2013 onwards for the first 1.5 million eligible customers, based on a first come first served basis. Only Malaysian youth aged between 21 and 30 year old with a gross salary not exceeding RM3,000 are eligible for this offer. Find out more from U Mobile. Lowyat.NET 10th Anniversary x LANSI T-Shirt Has Landed!